Global Fund for Women believes in the power of girls to change their own lives, to write their own stories, and to create their own futures. We know that girls have the ideas, energy, and drive to be visionaries in their communities and countries. As leaders of the next generation, girls are key to achieving systemic transformation that will build a world grounded in justice, fairness, and equity. But the reality is that girls’ potential often goes unrealized. More than 130 million girls under 18 around the world are not in school, due to gender bias, conflict, cost, early marriage, and economic pressure on them to work. Around the world, half of all sexual assaults are committed against girls under the age of 15. And every year, an estimated 10 million girls are married before they turn 18—often with no say in whether, when, or whom they marry. Girls are demanding more. They are demanding the opportunity to realize their rights and live to their full potential. 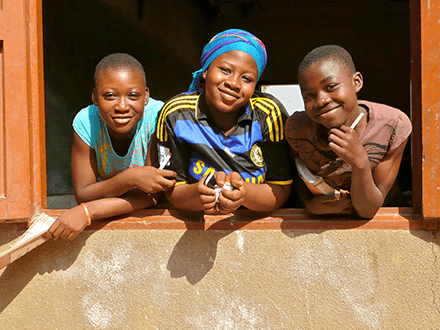 Collaborate with peer funders working both globally and locally to foster mutual learning for advancing the leadership and rights of all adolescent girls. Through the Adolescent Girls Fund, we will deepen our focus on not only the needs of girls, but also the ideas and solutions they themselves hold. Now more than ever, we believe that adolescent girls must be strengthened as movement actors so their collective voices, innovation, and power can fuel the leadership pipeline of women’s movements. With seeding support from NoVo Foundation, and in a unique learning partnership with our sister organizations EMPower, FRIDA – The Young Feminist Fund, MADRE, Ms. Foundation, and Thousand Currents, we will fund girl-led movements in under-served geographies, accompanied by resources and support for national, regional, and global learning, strategizing, and networking among grantee-partners—resulting in a stronger movement for girls’ rights and leadership. We know that with the right opportunities, girls have the power, ideas, and passion to drive incredible transformation—for themselves, their communities, and the world.